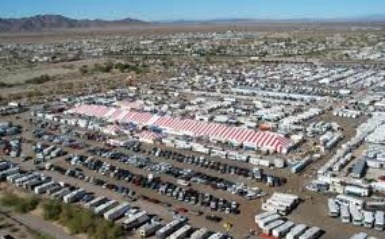 Many people get started in the RV lifestyle by attending an RV show... this is a picture of the RV show in Quartzsite, Arizona...a town of less than 1000 during the summer that attracts over 100,000 RVers in the winter. Here is a list of the 2013 RV shows...one is bound to be near where you live. This would be highly recommended for someone that is contemplating the RV lifestyle... you can walk through travel trailers, motor coaches, fifth wheels, etc. to your hearts content... you can get a lot of your questions answered if you find a knowledgeable salesperson or start a conversation with another person such as yourself at the show. Pick the brains of experienced RVers, most love to talk about their likes and dislikes of this retirement lifestyle. The best pieces of advice I could ever give anyone, if it's sailboat cruising, RVing, or retirement in general... is not to wait for the "perfect" situation. 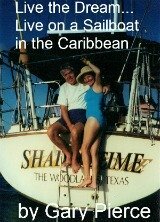 How many times have you heard, " I'll retire when I get X amount of money", " I will go sailing when I can afford a 40 foot boat"... the same thing applies to people contemplating the RV retirement lifestyle. Never say I will go RVing when I can afford an XYZ coach, of a certain size, with the following options... Of all my favorite corporate slogans, I think Phil Knight has the best, JUST DO IT... if you wait for the perfect RV to show up you may never go. Whether you you want to use an RV as a means to see all of the national parks, visit the grandkids, or stay away from snow... the RV retirement lifestyle will allow you to do all of this and more. If you don't like the neighborhood, fire up the engine, and move. The mobility that RVing offers you is truly unmatched and will satisfy the wanderlust in most anyone. Thanks for reading try RVing...you will not be sorry.